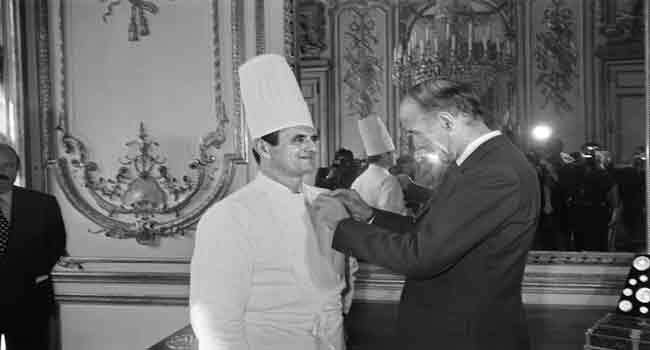 (FILES) This file photo taken on February 25, 1975 shows French President Valery Giscard d’Estaing (R) awarding French Chef Paul Bocuse with the Legion d’Honneur at the Elysee Palace in Paris. Bocuse died at the age of 91 on January 20, 2018, according to French Interior Minister Gerard Collomb. Top French chef Paul Bocuse, a giant of 20th-century world cuisine, has died, French Interior Minister Gerard Collomb announced on Twitter on Saturday. Bocuse, who had suffered from Parkinson’s disease for several years, was 91.